This tab was designed as a lower mount for your motorcycle rear fender, though it can be used universally to mount anything you like. It is 1/4 inch thick mild steel and has a 90 degree bend and a 5/16 inch diameter hole in it. This will work well with most any custom rear motorcycle fender and saves a lot of time and hassle in the garage. 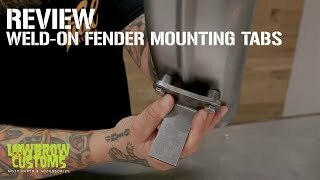 Check out the Upper Fender Mount for Curved Fenders, DIY Fender Strut Kit and DIY Sissy Bar Kits to finish mounting your fender. Made in the USA. Bought 2 uppsers, and one lower. Used on both of my bikes. Simple look and the are super beefy. Solid part, nice and hefty, haven't mounted yet but its exactly what I needed. No more messing with spacers. Good stuff Lowbrow, keep it up.